I am currently working on a project with Neil Brand to recreate, at least in part, a multimedia show of considerable importance to the popular understanding of one theatre of the First World War, and one man in particular. With Allenby in Palestine and Lawrence in Arabia was the creation of the American journalist Lowell Thomas, who journeyed to Europe on a propaganda mission to uncover stories that would encourage American support for the war. Not satisfied with what he found on the Western front, Thomas moved to Palestine, where General Allenby’s war against the Turks promised a less sullied, more symbolic conflict. And it was there, in Jersualem in March 1918 that Thomas met the man who was to make his fortune, and whose own fame he was to play a major part in securing. Thomas famously said of Thomas Edward Lawrence (1888-1935) that he had “a genius for backing into the limelight”. The shy archaeologist working for British intelligence who was instrumental in organising the Arab revolt was simultaneously repelled by and fascinated by fame. This post will not attempt to tell the story of T.E. Lawrence, which is amply documented elsewhere, but it will cover the handful of occasions on which the man who shied away from publicity, to the point where he took on an assumed name and a humble occupation after the war, nevertheless appeared before motion picture cameras. By my calculation he was filmed on five occasions, each for a brief moment only, yet each iconic in its own way. Unlike the many photographs of Lawrence that exist, which seem filled with mystery and contradiction, the films of him capture his ordinariness in extraordinary circumstances. 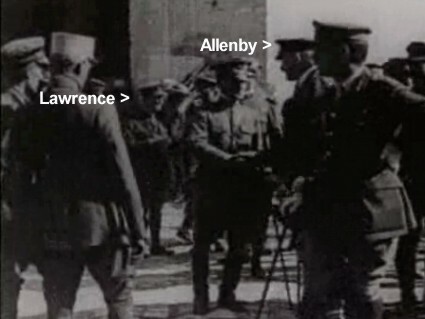 The first two films of Lawrence to be made were two shots from the same newsreel film taken on 11 December 1917. On 9 December Jerusalem fell to the Allied forces led by General Edmund Allenby, the great hero of the hour. There was obviously huge symbolic significance for Western audiences in seeing Jerusalem being freed from centuries of occupation by the Ottoman Empire. Two days after the city’s capture, Allenby organised a march on foot into the city (intended as a humble gesture to contrast with the Kaiser’s earlier choice to drive into the city). A proclamation was then read out promising respect for all religions. But the second shot of him in the film is more mysterious. It shows Allenby in conversation with someone, but the figures standing around part, and the small figure of Lawrence emerges, glancing coyly at the camera, almost as if to say you don’t know who I am – but one day you will do. So far as I have been able to tell (and it’s a film I have studied over many years), Lawrence does not appear in that part of the film where the proclamation is read, though it is very likely that he is somewhere among the crowd listening to Allenby’s significant words being read out. It was just over two months later, in March 1918, when Lowell Thomas turned up in Jerusalem and asked to see the young officer whose exploits were the subject of marvelled rumour. Thomas was accompanied by Harry Chase, a seasoned photographer also equipped with a motion picture camera, with whom he had been recording Allenby’s campaign, mostly in retrospect. Lawrence recognised Thomas as the journalist in search of a good story that he was, but also as a reasonable man. He saw that Thomas’ mission could be used to help promote the little-known Arab revolt, but also that he would need to keep Thomas at arms’ length to protect his much-valued privacy. This is borne out in the photographic and cinematographic record. 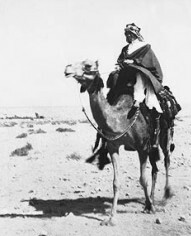 Lawrence permitted Chase to take a number of photographs of himself in Arab dress, both in Jerusalem and outside his tent in Aqaba. Thomas had persuaded Lawrence of the need to have several photographs, on account of the illustrated show that he had in mind. But Thomas only spent a couple of days close to Lawrence, and the film record bears this out. It is not much of a documentary record, but Lawrence could not have imagined how Thomas’ genius would turn his relatively slender material into a show that would be viewed by millions. 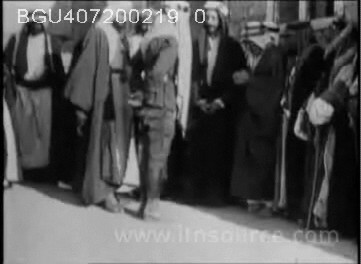 Putting together all that he gathered from the various war fronts into a series of shows which he put on in New York in March 1919, Thomas found that his Arabia and Palestine material was easily the most popular. A British impresario, Percy Burton, saw the show, and brought Thomas and Chase (who served as projectionist) over to London, where With Allenby in Palestine opened at the Royal Opera House in the unpromising month of August. Within days the show – which Thomas labelled a ‘travelogue’ – had become With Allenby in Palestine and Lawrence in Arabia and it was the talk of the town. Londoners were charmed by Thomas’ easy-going narrative style (he presented every screening, two a day of a two-hour show) and enthralled by the romance of Lawrence’s exploits. As Thomas told them, here was being “one of the most picturesque personalities of modern times, a man who will be blazoned on the romantic pages of history with Raleigh, Drake, Clive and Gordon”. It wasn’t exactly historical truth, but it was exactly what audiences wanted. An estimated one million people saw it during its London run (it also played at the Royal Albert Hall, the Philharmonic Hall and the Queen’s Hall) and four million world-wide. The show was a combination of prologue, musical interludes (organ music and the band of the Welsh guards), Thomas’ narration, photographic slides (many of them hand-coloured) and films. It established the romantic legend of Lawrence of Arabia, enshrined in Thomas’ book of that name published in 1924, in the short documentary film of the same title in 1927, and on to the David Lean film, which builds on the image of Lawrence created by Lowell Thomas (who is portrayed in the film as Jackson Bentley, played by Arthur Kennedy). This is a speculative one. Lawrence attended the Versailles peace conference negotiations as part of Faisal’s delegation between January and May 1919. Some twenty years ago I was watching a television programme on the First World War when an archive film sequence was shown of the Versailles conference. A group of men walked past the camera in the palace grounds, and one of them – I swear – was T.E. Lawrence. I’ve searched high and low for this sequence ever since and never found it (and I can’t remember what the programme was) but I’m certain I saw him. Perhaps someone out there could confirm this or otherwise for me. Following Versailles and a short period serving as an advisor to the Colonial Office, Lawrence turned his back on his growing fame by enlisting in the RAF under the name of John Hume Ross. This attempt as disguised was soon rumbled, but he tired against, this time enlisting in the Tank Corps as Private T.E. Shaw, later rejoining the RAF under this name. But while he was hiding from those who pursued him because of his fame, he was also worked to increase that fame by publishing an account of his experiences as The Seven Pillars of Wisdom (1922). The US publisher of this was Frank N. Doubleday, and the next film of Lawrence is a film taken at some point in the late 1920s (or possibly early 1930s) at a picnic and for a photo shoot outside Doubleday’s home (the first sequence feels like a home movie, but the latter looks professional). A somewhat world-weary-looking Lawrence eyes the camera with something that comes half-way between caution and amusement. Our final film of Lawrence is pure paparazzi. 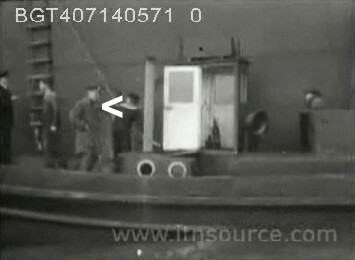 He was pursued by photographs and cameramen throughout the last years of his life, and finally in Feburary 1929 one newsreel cameraman got lucky. There is a Gaumont Graphic newsreel which shows some wobbly, long-distance shot of the then Aircraftsman Shaw disembarking at Plymouth from India, where he had been on a supposedly secret mission. “Despite all precautions Gaumont Graphic cameraman secures exclusive pictures of ‘elusive Lawrence'” boast the intertitles. T.E. Lawrence died in a motorcycle accident in May 1935, and the several newsreel films on his funeral lauded his achievements and his legend with what little footage they could muster. 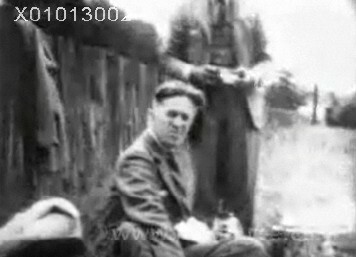 The Doubleday picnic film, the Shaw footage and the Thomas footage were used (the latter without anyone pointing out which shots showed Lawrence), but not Lawrence’s appearance in the Jerusalem film. This was not spotted for many years thereafter. Lawrence’s experience with the motion picture camera says a lot about the progress of twentieth-century fame. Lawrence’s time in the limelight came at just that point where cameras were becoming inescapable and the celebrated had to learn not to avoid them but how to live with them. Television made the game of escape impossible, but the newsreel camera was a little more cumbersome, and those who wanted to flee its gaze could do so for a while, or at least be caught only on the sly. Lawrence mastered photography (and still portraiture in general) because he could control the conditions under which still images of him were taken, but the motion picture camera was more dangerous. It showed more than the myth – it could capture the real man, which above all is what Lawrence wanted to hide. Our partial recreation of With Allenby in Palestine and Lawrence in Arabia features at the British Silent Film Festival at the Leicester Phoenix or Friday 16 April, at 11.15am. It’s being presented as a work in progress, and depending on how well it goes we’ll see if we can take the project further and devise a fuller recreation of Lowell Thomas’ travelogue. General Allenby’s Entry into Jerusalem (the short newsreel versions – a longer, ten-minute version also exists) can be seen on the BFI’s Screenonline site, accessible to UK libraries, schools and colleges only. The film is held both by the BFI National Archive and the Imperial War Museum. Shortened versions of the Lawrence sequences filmed by Harry Chase in 1918 can be seen in a 1935 Gaumont-British News item available on the ITN Source site. The Doubleday picnic film can be seen on ITN Source and used in a 1935 Fox Movietone memorial item with commentary by Lowell Thomas, included in the same clip. The various Lowell Thomas films of Allenby and Lawrence, in unedited and edited form, are held by the Imperial War Museum. An almost complete version of Lowell Thomas’ script for With Allenby in Palestine and Lawrence in Arabia is available on the web archives website of Marist College, USA, which holds the Lowell Thomas papers. The script comes from a presentation of the show in Ireland and has several local references. The Marist site also has a selection of Harry Chase’s photographs and a digitised copy of Thomas’ diary. Lawrence’s official biographer Jeremy Wilson has an excellent blog on Lawrence, which includes this recent post on Lowell Thomas’ 1919-1920 shows. There is also a fascinating thread from the T.E. Lawrence Studies list, managed by Wilson, discussing the relationship between Lowell Thomas and Lawrence. Can’t wait to see the result of your and Neil’s work on this…but one thing. Emir Feisal though….Alec Guinness, wasn’t it?? Oh dear – well spotted. Indeed it was Alec Guinness. Omar Sharif played Sherif Ali. I’ve changed it. This should be a great show. I listened to Lowell Thomas’ radio news program until he retired in 1976. I remembered how surprised I was to learn about his experiences with T E Lawrence. I heard about your Lowell Thomas/Lawrence project through Jeremy Wilson this morning. What a shame I found out so late – I’ll not be able to make it this Friday. But I’ve long held a candle for recreating the whole LT stage show – are you including the slides or just the moving film elements? And how about the flying over the Pyramid shots that reportedly had everyone jumping out of their seats?! Very best of luck – it’s a great idea. As to your question about Versailles I think you’re right in that there is almost certainly footage of the Arab delegation in Paris standing in a mixture of Arab clothing and British military uniform but I’m not sure Lawrence is there – at least in the material I’ve seen (and we trawled everything we could find for our 2002 drama-documentary for PBS/BBC2 ‘Lawrence of Arabia: An Arab Perspective’). I think I might have a copy of at least some of it – I’ll do some digging through my old tapes and DVDs if you’re interested. Hopefully there will be other chances to see the show, and in a much fuller form. We’re only presenting a third of it, from the Lawrence half of the show. It will include all of the original images so far as they can be identified (and located) and some of the film clips – it was too complicated to incorporate them fully in the short time there has been to put the show together. It’s technically complicated, and much more research is needed. At any rate, I now hugely admire Thomas and Chase’s professionalism in constructing such a complex production. I’d like us to extend the work to produce a full recreation, which would therefore have the first half of the show which covered Allenby – and which had all the aerial footage. Friday’s show is a work-in-progress, testing the material with a modern audience. We’ll see how it goes, then plan. Re Versailles, I just remember seeing a group of men in uniform (I don’t think Faisal was there) walking past the camera, somewhere in the palace grounds, and being startled because one of them was clearly Lawrence. I scoured the online newsreel archives when writing the post, but couldn’t find the clip. Do please dig if you have the time – and anyone else reading this. Glory will be his or hers who first find it. A fascinating post: I’ve been trying to find all the information about Lawrence’s onscreen appearances in one place for ages. Thanks too for the link to the Lowell Thomas script, and the best of luck with turning your recreation into a full-blown show. It would also be good to know when the picnic film was made, and where. I’ve put the date as late 20s, but it could just as well be early 30s – if only to judge by Lawrence’s appearance. Frank Doubleday died in 1934. Footage sources say that it was filmed in the USA but that’s clearly wrong, since Lawrence never went there, so did Doubleday have a British home or somewhere that he stayed when he was in the UK? It has been suggested to me that it is not T.E. Lawrence seen driving a car with Feisal as his passenger in the Thomas films. Thomas makes this claim in the 1927 film With Lawrence in Arabia, but the image is so indistinct that it is hard to say one way or another. Just a minor point – I am pretty certain that the shot of TEL standing in a doorway with Mr & Mrs Doubleday is possibly “the wrong way round/image reversed” – ie TE’s hair parting is on the wrong side, compared to contemporary photographs. Also I believe the “picnic” shot is shown “the wrong way” round – the stencilled word on the side of the hamper is “back to front”. Well spotted. The other give-away is that everyone is eating their food with their left hand. Is it too late to add that there are two other films of Lawrence, not mentioned here, dating from the time when he was working on boats? One, of 1931, shows him on a powerboat with Air Ministry officials, while the other, from April 1934, shows him working on the Aquarius. It’s not too late, since you have kindly added the information to the comments of this blog. Could you provide any more information on the films? Are they newsreels, or private films? What begins at about 2.30 is probably the 1931 film. Unfortunately I don’t know the sources. The author of this video says he personally looked for the clips before putting them together (it is in the comments), so I think you should ask him. He has posted a second video with further clips, two of which (ripped from ITN Source) are identified in this post and another which is the Versailles shot that I thought remembered. Did he use your clips of picnic and India? Anyway, I suppose that now we only lack the 1934 film. Graham, can you tell us something more? He’s got in touch, but says only that he lifted the clips from Spanish and possibly French documentaries. So some footage researcher somewhere did the hard work and found the Versailles footage. Filmographically there’s still a bit of work to do, and the 1934 film – whatever it might be – remains elusive. As for the Versailles shot, the man getting out of a car following Prince Faisal was Nuri as-Said, I guess. Nuri was on a well-known group photo (including Faisal and Lawrence) taken at the Versailles, wearing the same headgiea of the man of the newsreel. Have you seen another film clip shot just after the above-mentioned group photo taken? I saw that on a Japanese TV program on Lawrence. Here is pictures from the clip. I found a link to this site via Jeremy Wilson’s blog. I just want to confirm “urbanora’s” Apr 13, 2010 comment that there might be a movie (newsreel) clip of Emir Faisal’s entour age at the Paris Peace Conf. taken, there was a follow on movie of them passing by as they descended the stairs they were on. TEL is very visible among them. This clip appears 24 minutes into the special subject (documentary) offering (T.E. Lawrence and Arabia) on Disc 1 of Volume I of George Lucas’ three volume DVD collection entitled “The Adventures of Young Indiana Jones.” The same documentary occurs on Disc 8 of Volume II. There are abt. 35 documentaries to accompany the 22 fictional adventures that were broadcast on TV in the US. The fictional adventures start in Egypt (where Indy first meets TEL) and imaginary exchanges of letters with TE are used as transitions between the adventures until they bid goodbye in the “Winds of Change” adventure in Vol. III. A few of the documentaries have appeared on the History Channel, but this treasure trove that was deeply researched can only be found in total on these three volumes selling for about 100 dollars each in 2007. Besides the TEL special, there are ones on the Peace Conference, Lowell Thomas (with lots of tinted slide copies! ), Winston Churchill, Gertrude Bell, S. Sassoon, R. Graves, and the Daredevils of the Desert, etc. There are things on these documentaries that are unique as well as seldom, if ever, seen. The old news clips have been smoothed out and look as though they were taken only days ago. One doubts that their production costs were ever recouped by Lucasfilm, and the whole presentation appears to have been a “labor of love” of Rick McCallum and the historians employed. To find the origin the Faisal clip, one might have to contact Lucasfilm. I would also visit the Lowell Thomas archives at the Marist College web site where there are not only stills and slide images to be seen, but also movie pictures. I have not had the time to check out the movies, myself. Curiously, I would think some TEL fan might have interviewed George Lucas about TEL since both the Indy stories, and Star Wars episodes, have thematic parallels to Lawrence’s adventures – in my view anyway. Wow. Many thanks for this – I’d not heard of the George Lucas series and would never have thought of it as a rich source of archive film. As you say, we still need to identify the original source, which is probably one of the American newsreel archives. So it seems we have two or maybe three clips that exist showing Lawrence at Versailles. I have used the Marist College website, which holds the script of Lowell Thomas’ travelogue which started me on this particular investigation. The films they have will be duplicated or exceeeded by those held by the Imperial War Museum in the UK, which has the surviving original film material shot by Harry Chase for Thomas. I have viewed this and note the sequences where Lawrence appears in the above post. Thank you again for such an informative comment. YouTube is a marvel, though I tend to exercise caution is recommending it as a research resource. So much has been ripped from other sources without permission, and I try always to verify that the source is legitimate before posting any link to a YouTube video – though determining legitimacy isn’t always easy. As it is, the dengler11 clips are mentioned in some of the comments above. Can it be confirmed that someone is working to revive the Lowell Thomas slide show with the tinted pictures? With television (BBC, National Geographic, History Channel, and others) ever on the lookout for material, I’m surprised it has not happened long ago! It would be nice to have the show include the Paris Peace Talk material and be accompanied by a discussion panel (before Lowell Thomas Jr., historians, and TE’s biographers and enthusiasts have all disappeared.) Perhaps TV does not offer a deal that would appeal to copyright holders in these days of “slim customers” and (n/gr)eedy sellers, tsk. Still, these outfits sell DVD and Blu-ray discs on subjects of often far less appeal than TEL’s adventures – in my opinion. I looked at recreating With Allenby in Palestine and Lawrence in Arabia together with actor/musician Neil Brand. We did a trial version of part of the Thomas script with slides from the Marist College collection and film clips from the Imperial War Museum earlier this year. The show worked OK, but we’ve decided not to take it further in that form. My feeling was that the script wasn’t strong enough in this day and age, and indeed would be misleading since it gives a version of events that we now know is incorrect. There would of course be value in seeing a full recreation somewhere, but I think it would be of specialist interest only, and wouldn’t interest a broadcaster. In short it would entail greater expense than it was worth. That said, Marist College archives would like to create some sort of online experience based on their materials, and others retain the dream of recreating the show. But not me. Of course the material could be utilised for a documentary about Thomas and/or Lawrence. The story of their relationship is a fascinating one and I’m sure it will interest a programme maker some day. Of course you are so right, urbanora, (your 1 Nov ’10 above) about any effort to reproduce the L. Thomas lecture show as it was originally presented would hardly be possible. After reviewing the Thomas documentary in Volume 3 of the Lucasfilm “Young Indiana Jones” DVD series, I saw there that it took three arc light projectors to portray the pictures accompanying Thomas‘ narrative. This intrigued me. I have not found a description of just what the pictures looked like as they were merged with the script. Why three projectors? Referring to the “colour” category listed on the right hand border of this web page, and knowing that hand-tinted and colorized segments often appeared in early movies (in the first decade of the 1900’s), I wonder if one projector was used for stills (tinted plus b&w ones) and the other two to overlay separate red and green filtered reels for exposures covering landscape movie segments taken with an English Kinemacolor camera. Several of the color pictures in the Lucasfilm documentary have green earth and red (sunny) skies that clearly are more vivid than the hand tinted images. How it all was done must be explained somewhere. I still think that a detailed description of how it was all put together would make a fascinating story. I’m sure the color and dramatic verve of the pictures had a lot to do with the lecture’s great audience appeal! The documentary stated that putting it together exhausted the grant that had been given Mr. Thomas for the project, and we have George Lucas’ deep pockets to handle what he put into his treatment. As for the level of interest that might be around in this day and age, didn’t almost 15,000 costumed souls … (www.wired.co.uk/news/archive/2010-09/07/lawrence-of-arabia-secret-cinema-review) … turn out this September at Alexandra Palace overlooking London for a Secret Cinema (www.secretcinema.org) re-enactment and showing of Lean’s “Lawrence of Arabia?” What a lark! True, it may have “maxed out” interest in the subject for some time, at least for those who attended. Tsk, tsk! Thanks so much for YOUR time and effort, Molly B.